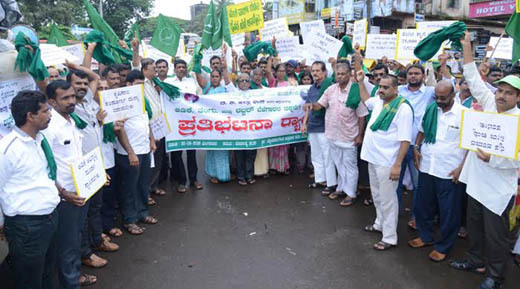 Mangaluru, Aug 31, 2016: DK District Karnataka Rajya Raitha Sangha and Hasiru Sene President Ravikiran Punacha on Aug 30, Tuesday demanded the state government to take corrective steps in the interest of arecanut, rubber and coconut farmers in the region. 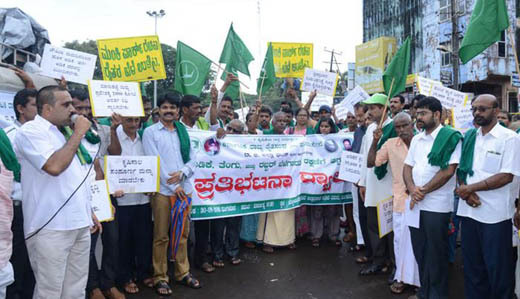 Addressing protesters at the protest held in front of the DK DC’s office, Punacha said, "Arecanut Development Board should be constituted and a price of Rs 350 should be fixed for every kg of arecanut, Rs 160 for one kg of rubber and Rs 25 per coconut. A corpus fund of Rs 2,000 crore should also be set up to buy farm produce during difficult times." Punacha wanted the government to buy the new batch of arecanut for the existing older price in view of Ganesh Chaturthi festival. He explained, "Arecanut is grown on a vast area of 50,000 hectares and each hectare yields 10 to 15 tonnes of crop. In addition to this, rubber is cultivated on 18,000 to 19,000 hectares of land." Elaborating on tapping more revenue from cultivating coconut, Punacha cited the example of Kerala model where the farmers have succeeded in generating at least Rs 16,000 from every coconut tree per annum by tapping Neera. It is possible by bringing amendment to existing Neera Act in that state, he added. Raitha Sangha and Hasiru Sene Vice President G T Ramaswamy said, "The time is ripe for forming a political party alternative to three prominent parties in the state to ensure that a true representative of farmers is elected to the Legislative Assembly." Ramaswamy reasoned that farmers continue to be a neglected lot, with undervaluing of most of the agricultural produce in recent years. While the farmers continue to suffer, the retailers and others involved in the trade are making a windfall, he said. A memorandum with a total of 18 demands was submitted to the chief minister’s office through the deputy commissioner. Earlier, farmers took out a rally from Jyothi Circle (Ambedkar Circle) to the DC’s office. Protest is common these days. The permission should not be given for protest.